I don't write a lot of reviews, so I'm going to get the essential part out of the way before I inevitably forget. 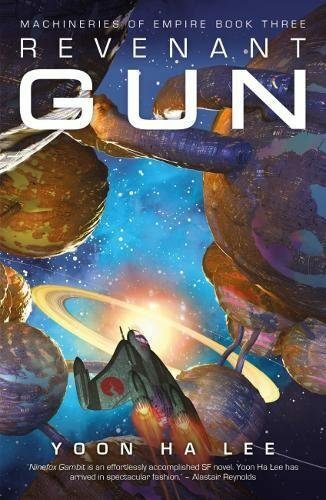 To wit: Revenant Gun is a great book. I liked it a whole lot. (I immediately added it to my “favorites” shelf on Goodreads, a tier occupied by only twenty-four titles, two of which are the previous two books in this trilogy.) Yoon Ha Lee stuck the landing, and in doing so cemented that the Machineries of Empire series is one of the most ambitious and rewarding science fiction series in print. “You know what's going on, right?” Ninefox Gambit asks. Often, you have to say, “Uh, yeah, of course,” when the real answer is “I have no idea, but I really, really care.” And then you keep reading. My everlasting thanks to Salzman-Cohen for this wholly accurate description of the reading experience. My father, an American, was a Peace Corps volunteer in South Korea in the '60s. He's described to me the method of language tutoring he and his fellows received before departure. Rote repetition by sound alone, over and over, the feel of the thing before the thing itself, syllable by syllable, getting to know how words should sound before they knew what they meant. Calendrical warfare, calendrical rot, banner the Deuce of Gears, and deploy the threshold winnowers. By the time you arrive at Revenant Gun, you're fluent, and what you're left with is really, really, really caring. There's no shortage of characters to really care about in this third installment. The novel moves between three points of view to give us the scope of events. There's Kel Brezan, now High General Brezan, who finds himself a reluctant head of state following the coup that Cheris pulled off in Raven Stratagem. Through Brezan we also spend some welcome time with Hexarch Shuos Mikodez, with crucial cameos by his assistant's cats. Brezan and Mikodez find themselves variably at odds and in alliance with General Kel Inesser, a character mentioned, but offscreen, in the previous two books. She's intimidating, brilliant, petty, but strategic about it, and exudes an air of being too old for all of this. I found her a welcome addition. We get a new point of view character in Hemiola, a snakeform servitor that served for centuries on hexarch Nirai Kujen's secret evil moon base. Hemiola usually leads a peaceful life, tending to Kujen on his once-a-decade visits, and otherwise watching Andan serial dramas and making fanvids. Sadly, it then becomes accidentally involved with Ajewen Cheris, who is dabbling in that classic Jedao hobby: assassination. Hemiola has lived an isolated life up to this point; it is one of only three servitors on Kujen's secret evil moon base. When it takes up with Cheris, we're treated to a closer look at servitor society and some of its individual personalities. Unfortunately, we don't learn as much about Kujen's secret evil moon base as I'd have liked, other than that it seems to be made up of opulent bedrooms and scientific necromancy labs in a sort of open-plan office arrangement. It's also secret, and on a moon. And then there's Jedao. A Jedao whose most recent memories are of being a first-year cadet at Shuos academy, but who wakes in a body that seems much older. He's ordered by Nirai Kujen to take command of a swarm of warmoths to defend what remains of the hexarchate. Jedao, clever, brash, trapped, and lonely, fumbles his way to the truth about who he is, what he's done, and what's left that he can do. If you'll suffer me one medium-sized spoiler, it's this: the titular Revenant is a warmoth, and through it we learn that all moths are sentient beings. All of them living, thinking, alien creatures now domesticated and bred for the harness, all forced to make war on other moths. As trapped as any Kel beholden to their formation instinct, or every person living in fear of being declared heretic. The brutal, byzantine calendrical system that runs on ritualized slaughter, that paradigm we readers worked to learn, in each book of the trilogy it's a trap laid for the people within it. With compassionate characterization, Lee gives us the servitors and the moths, and makes them people too. The machineries of an empire are violences large and small, are war. Lee relentlessly reminds us that war is a self-sustaining state, and that the suffering it produces is its intended product. Every person suffers for an empire's wars, even the people it deems only tools.